Celinda Valeur lives on Venice Lane behind the 7/11. At around 11 a.m. on Wednesday, July 27, she and her three-year-old son were tending their chickens in their backyard when they were startled by a man jumping over their fence. He was being pursued by Sheriff’s deputies who had just conducted a drug bust at the Motel 6. After the man was apprehended, Valeur asked a deputy about the break-ins, drug use, and fighting that seems to happen with startling frequency in her neighborhood. The deputy, Valeur claims, quietly informed her of the parolee hand-off, said Sheriff’s officials are similarly frusterated with the trouble it causes, and advised her to make a formal complaint. She did, and has since been rallying other neighbors to speak out. “We’re getting terrorized, burglarized, and robbed on a regular basis,” Valeur said before repeating her concerns to the Carpinteria City Council on Monday. Her neighbor, Pat Compton, stated in a separate interview, “They have these things that are arranged, and as long as people don’t complain, they’re happy.” The home of Compton’s next-door neighbor, an elderly woman, was recently robbed when thieves slashed through her window screen. A business owner down the block claims to have repeatedly interacted with parolees, who say they’re from Oxnard. And a former Motel 6 employee, who worked night shifts for four years and spoke to the Independent on the condition of anonymity, said deputies respond to calls at the motel two to three times a week. He claimed that when he worked there, deputies would often cross reference a parolee manifest they carried with his guest list, which would invariably show a number of former prisoners booked among the motel’s 120 rooms. Statistics reveal an unusual amount of crime at the Via Real address — there were 505 calls for service at the location between mid-2013 and the end of August this year. 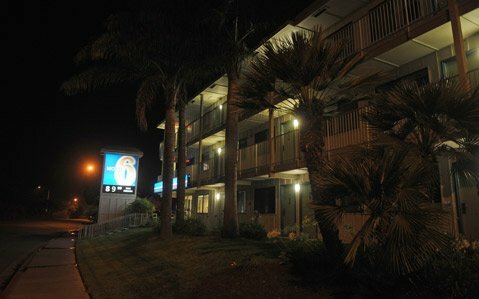 As a point of comparison, the Motel 6 along Santa Barbara’s waterfront received 175 calls between 2010 and 2015. The chain, which was founded in Santa Barbara in 1962, has more than 1,100 locations around the country. Christina Garcia is the current front desk manager of the Via Real Motel 6 and rejected any allegations that her employer knowingly or unknowingly books high amounts of parolees. “Absolutely not,” she said. “I work here six days a week. Nothing gets by me.” She said right now the motel is filled with families, soccer tournament players, and college students. A Motel 6 corporate representative did not respond to a request for comment.